Auto-Tune EFX 3 is the quickest, easiest-to-use tool for real-time pitch correction and creating the iconic Auto-Tune Vocal Effect. Auto-Tune EFX 3’s variable Retune Speed and Humanize controls provide an amazing level of natural, realistic pitch correction. And with the unique Auto-Motion Vocal Pattern Generation, stunning new vocal effects are only a mouse click away. The variable Retune Speed control lets you fine tune the desired effect for your track, from subtle natural pitch correction to the Auto-Tune Vocal Effect. 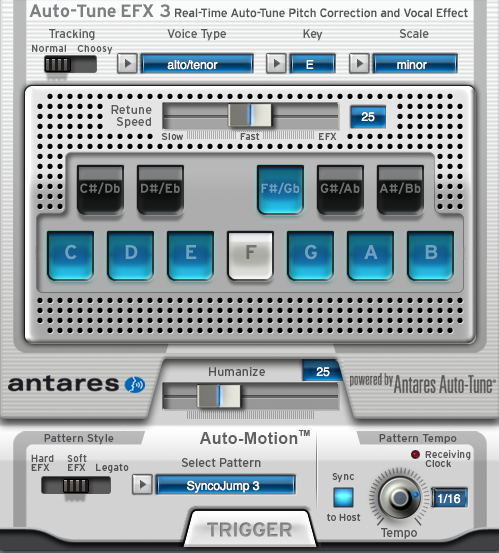 With Auto-Tune EFX 3, you're not limited just to the Auto-Motion patterns. Since Auto-Tune EFX 3's patterns are stored in standard MusicXML format, you can use any application that can open and edit MusicXML files (and there are free open source apps that can do that) to edit existing patterns and create entirely new patterns of your own. So your vocal tracks can always feature your own unique Auto-Motion effects. This Instrument requires an iLok Key!